An Iranian spokesman said on Monday that IAEA Director General Yukia Amano was warned not to disclose Iran's agreement with his agency to the US Congress when he testified there. The spokesman also said that the agreement abides by Iran's red lines, which include no inspection of military facilities. That would include Parchin where the Iranians worked on nuclear weapons. "In a letter to Yukiya Amano, we underlined that if the secrets of the agreement (roadmap between Iran and the IAEA) are revealed, we will lose our trust in the Agency; and despite the US Congress's pressures, he didn’t give any information to them," Spokesman of the Atomic Energy Organization of Iran (AEOI) Behrouz Kamalvandi said in a meeting with the Iranian lawmakers in Tehran on Monday. "Had he done so, he himself would have been harmed," he added. In relevant remarks early this month, Iran's Envoy to the International Atomic Energy Agency Reza Najafi warned the UN nuclear watchdog to avoid disclosing its secret agreements with Tehran. "The agreements signed between a member country and the IAEA are definitely secret and cannot be presented to any other country at all," Najafi said. Amano and Head of the AEOI Ali Akbar Salehi signed a roadmap of cooperation in Vienna on July 14. The roadmap contains secret arrangements stated in one or two documents entailing on the methods to be used by the two sides in their cooperation. 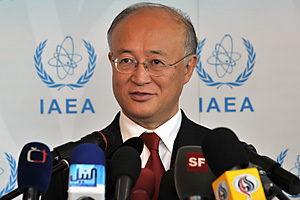 Senior Iranian nuclear officials have said that all IAEA member states have such secret agreements and the UN nuclear watchdog is duty bound to keep them secret to any third party individual or state. After the roadmap was signed, Salehi announced that the new agreement would fully settle all unresolved issues pertaining to Tehran's nuclear activities in the past. "All past issues will be resolved completely after Iran and the Agency adopt some measures," Salehi told reporters after signing an agreement called the Iran-IAEA Cooperation 'Roadmap'. He said that all agreements, including the measures decided for Parchin military site, will be implemented with full respect to Iran's redlines. Iran had earlier announced that inspection of the country's military sites are one of its redlines. #ThanksObama. What could go wrong?